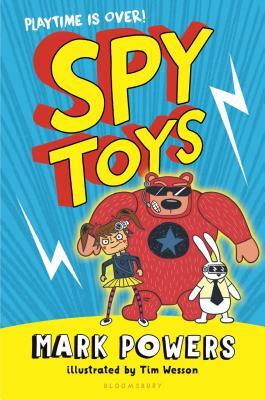 Spy Toys (Hardcover) | novel. The world's leading toy manufacturer gives each toy it creates a tiny, computerized brain and a unique personality making for some seriously awesome toys. But sometimes there's a faulty toy . . .
Dan is a "Snugliffic Cuddlestar" bear--he should be perfect for hugging. But because of a malfunctioning chip, Dan is so strong he could crush a car. Thrown into the rejects pile, he meets Arabella, a "Loadsasmiles Sunshine" doll, who has a very short temper. Soon Dan, Arabella, and Flax (a custom-made police robot rabbit) are recruited by the head of the toy world exactly for what makes them unfit. And their first mission is a doozy: to protect a senator's eight-year-old son from being kidnapped. With black-and-white illustrations throughout, this hilarious book has reluctant reader appeal written all over it. Mark Powers has been making up ridiculous stories since elementary school and is slightly shocked to find that people now pay him to do it. As a child he always daydreamed that his teddy bear went off on top secret missions when he was at school, so a team of toys recruited as spies seemed a great idea for a story. He grew up in north Wales and now lives in Manchester, England. His favorite animals are the binturong, the aye-aye, and the dodo. Tim Wesson was born somewhere in England. As a young boy he enjoyed climbing trees and drawing pictures of dogs in cars. Eventually he became an illustrator who creates children's books. Tim doodles and paints whenever he can and likes to draw the first thing that pops into his head. He lives by the sea in Suffolk, England with his family.